Turmeric is the ‘It spice’ of the moment, and with good reason. The curcumin that gives it a shocking yellow colour has been linked to health benefits ranging from heart-health and digestion-settling, to even fighting cancer. The only way it can be improved upon is to combine it with the nutritional ‘It food’ – almonds! Almonds, too, have a positive impact on a healthy heart, and are packed with a massive fifteen essential nutrients. Add the two together and you’re into deep superfood territory. Almonds have been proven to generate satiety (aka a satisfied full feeling) when eaten as a mid-morning snack. As someone who had been known to eat my packed lunch at 11am then be left lunch-less at lunchtime, this is incredibly good news. Since I started snacking on almonds, I have noticed that I make it to a socially-acceptable time to eat my lunch more often than not. I’ve also been loving them as a post-workout snack, chucked into my swimming or gym bag. If, like me, you prefer to eat unprocessed food, and to know what’s in what you’re eating, almonds are the original and optimal whole food snack – you can literally see what they are. No junk, no additives, no spooky ingredients. Just plant powered protein on the go. This recipe makes two snack-sized servings, so save the second one in an airtight container for your next snack attack. The citrus in this snack adds vitamin C (which will help you to absorb iron found naturally in almonds), and adds a little sweetness without adding refined sugar. I used satsuma juice because I had some in the fruit bowl, but orange juice would work equally well. I’d love to hear if you try this with any other citrus fruit – I can picture lime being zingy and fresh tasting.Let us know in the comments how you get on with the 21 Day Snack Happy Challenge, which hopes to help you discover just how easy it is to include almonds as a healthy snack option, every day. You can create new, healthier snacking habits by simply choosing a handful as a daily snack for 21 days, the length of time it takes to break a habit, and see how differently you feel at the end of it. (You might even make it to lunchtime before you eat your lunch, like me). Almonds are a nutritional powerhouse - boost this even further with anti-inflammatory turmeric, ginger and chilli. 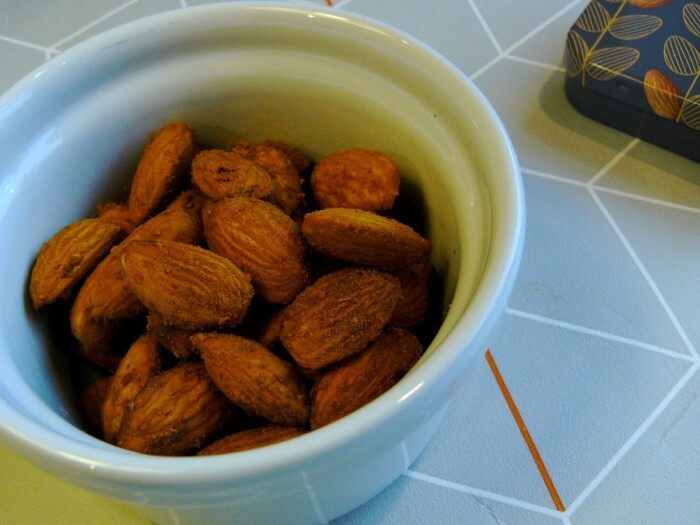 Mix the juice and spices well in a little bowl, then add the almonds in, ensuring they are all coated in the lovely golden liquid. Heat a non-stick frying pan over a medium heat, and chuck the whole almondy-turmericy mixture in, stirring round for about 40 seconds, until the juice has sizzled down. This post has been created in collaboration with the Almond Board of California.Watch the video below for some of Almond Ambassador Zoe Ball’s adventures with almonds (Spoiler Alert: They’re a little more dare-devil, and with a much better manicure, than my own adventures recently.) If you would like more recipes and information on how to #SnackHappy with almonds, trot across to their Recipe Centre here. Do you use raw almonds?